Dr. Ishrat Hussain, the Governor State Bank of Pakistan, presiding over first session of the First Annual Conference on Management of Pakistan Economy. Lahore School of Economics First Annual Conference on Management of the Pakistan Economy concluded here on April 30, 2005. In the concluding session, Dr. Moazam Mahmood from International Labor Organization gave out the recommendations the came out during past three days. Dr. Amjad Chaudhry, Rector Lahore School of Economics was in Chair. Over an intensive three days, from 28 to 30 April 2005, a number of pre-eminent economic decision makers, economists, industrialists, academics and intellectuals were invited to discuss a broad range of key issues on management of the economy. The presentations and discussions flowed logically and very well, from macro management of fundamentals of the economy, investment, growth, budgetary deficits, and external balances, to reliance on private sector investment, the role of the Public Sector Development Program, the fiscal feasibility of raising public expenditure to support this program, and the monetary constraints on doing this. The discussion then moved on from examining the macro aggregates of the economy to a focus on the real sectors of the economy, the growth and potential of the agricultural sector, the competitiveness of the post MFA industrial sector, and the institutional mechanisms for managing these sectors. The third day focused on three priority policy challenges, human resource development, poverty and employment, and governance. Many important policy priorities came out clearly over these three days. Dr. Ishrat Hussain the Governor of the State Bank of Pakistan was satisfied with the management of macro fundamentals, and said that the recent recovery in growth had been enabled by lowering the price of credit, but inflationary pressures threatened, hence the increase in interest rates from a range of 4% to 9%. Ashraf Janjua, the former Deputy Governor of the State Bank urged an even more cautionary approach, and urged raising interest rates further to contain inflation. However he agreed that growth was a prerogative, especially if it was pro poor, and stated that with this caveat higher inflation could be tolerated for the sake of such higher growth. The Minister for Investment Dr. Abdul Hafeez Sheikh prioritized the role of the private sector in generating this growth, but was concerned that the state pre-empted much of this space from the private sector, or certainly rationed this space. Dr. A. R. Kemal examined the feasibility of generating this growth through increased public expenditures, but was worried at the inelasticity of revenues, which did not seem to rise with growth, and feared that unless this was enabled, increased expenditures would increase budgetary deficits and the debt burden. Dr. Akmal Hussain pointed to challenges in agriculture, primarily the increasing volatility in its growth. Dr. Zafar Altaf the former Secretary for Agriculture explained that the huge diversity in agricultural conditions in Pakistan did not permit a one fix solution like increasing water availability although that was very welcome, and that a range of support incentives were needed to realize the considerable potential growth in agriculture. Faizullah Khilji Chairman of the Tariff Commission pointed out the competitiveness challenges to manufacturing in a post MFA world without quotas but with fierce competition from huge producers like China. Tahir Jehangir a leading export industrialist in cotton goods himself pointed out the necessity to move up the product ladder to higher value added in cotton, and onto mechanized products. The policy sessions on education and poverty and employment brought out three clear policy proposals. Sartaj Aziz the former Minister of Finance stated that education should be a statutory right, whose expansion required not just fiscal space which had been diminishing for the provinces, but also reform of the educational system to avoid waste. Dr. Rashid Amjad from the ILO argued that the poor needed the protection of a statutory minimum wage. Shahid Kardar added that this protection could be enhanced by winding up the existing charities with their huge leakages and using the funding to finance Guaranteed Employment Schemes in poorer regions. 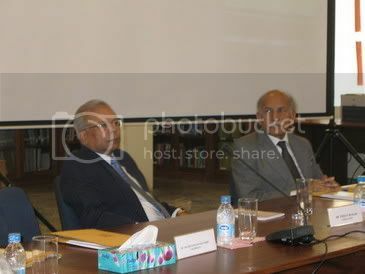 Sartaj Aziz, Vice Chancellor Beaconhouse National University presented a paper on Investment in Education and Skill Development and Dr. Rashid Amjad from ILO presided the first session of third day of Lahore School First Annual Conference on Management of the Pakistan Economy. In session two, Dr. Rashid Amjad of ILO contributed a paper on Pakistan Poverty Reduction Strategy: Why Employment Matters? Shoaib Sultan Khan, the Chairman Pakistan Rural Development Program presided the session. Khalid Ahmed of weekly Friday Times contributed a paper on governing the State and Dr. Tahir Sidiqui, former Secretary Planning Division was in chair in the third session of the day. In concluding section of the three days conference Dr. Moazzam Mehmood from ILO gave out the recommendations that came out over past three days. Dr. Ishrat Hussain, the Governor State Bank of Pakistan, inaugurated the First Annual Conference on Management of Pakistan Economy at the Main Campus of Lahore School of Economics this morning. Dr. Shahid Amjad Chaudhry, the Rector Lahore School of Economics was in chair. Speaking on the occassion, Dr. Ishrat Hussain said, “Since 2002, real GDP growth in Pakistan has accelerated from 3.1 percent to 7.6 percent (expected this year). During the same period, per capita income has increased from 0.9 percent to 5.6 percent, budgetary deficit has declined from 4.3 to 3.2 percent. Similarly, the debt servicing capacity has improved substantially along with decline in external debt burden. First session of the three days conference covered the subject of “Entrepreneurship, Private Investment and Economic Growth. Dr. Abdal Hafeez Sheikh, the Minister of Investment, Government of Pakistan was in chair. Mr. Manzur-ul-Haq, the Chairman PICIC and the Chief Executive International Housing Finance Ltd contributed a paper on the subject. In session two, Dr. Shahid Amjad Chaudhry, the Rector Lahore School of Economics was in chair and Dr. Suleman Ghani, Planning and Development Department, Punjab contributed paper on Managing the Public Sector Development Program 2005-10. Dr. A. R. Kemal, the Director PIDE spoke on Microeconomics Management: Breaking Out the Debt Trap. Dr. Shakil Faruqi, Professor Lahore School of Economics presided the session. Fifth Annual Convocation of Lahore School of Economics is being held on May 4, 2005 at the Main Campus. Lt Gen (Retd) Khalid Maqbool, Governor Punjab will preside over the function. Recipient of M Phil, MBA, BBA and B.Sc for the years 2003 and 2004 will be awarded degrees. All recipients are required to register at Lahore School Offices. Blogging must be integrated early in the course design and must be clearly connected to the course outcomes before it can become anything more than just an extra task for the students. Grading does seem to motivate the students, but it seems to be more effective to grade according to effort in relevancy to course content and outcomes than simply on numbers of submissions. There is an issue with privacy, particularly with older students. This should be addressed by emphasizing how to secure and share entries. Instructors need time to evaluate the importance of self-reflection as a methodological approach in learning as well as the value of integrating personal voice in the learning context. Otherwise the exercise will be perceived as futile to the students. Lahore School of Economics is a fertile recruitment ground for national and multinational companies. On April 4, 2005, Coca Cola Export Corporation gave briefing to Lahore School BBA / Bsc (Honors) students and conducted interviews in the City campus for internship for one of their brands.